Our nuclear fusion reactor control system is a core control system supplied to ITER (International Thermonuclear Experimental Reactor), the first to be attempted in the world in France. The entire control system of ITER is composed of three mutually independent vertical structures; the conventional control system in charge of operation at a normal state; the interlock control system in charge of equipment protection in case of abnormal operation; and the safety control system in charge of human safety at all circumstances. Such vertical structure is again separated into two horizontal structures of the central control system and the plant system, resulting in a total of six control systems. The central control system is directly managed by the ITER international agency, and the 170 plant systems are separately managed by each of the 7 ITER member countries. CFS is the central control system essential to the nuclear fusion reactor, for which the SDN (Synchronous Data Network) within the CODAC, the high speed network software for plasma control, was developed by Mobiis. It guarantees a stable transmission performance of inter-node communication of all central servers and plant systems connected to SDN within 50 microseconds of delay and 50 microseconds of error. As a result of 100,000 communication tests on the nuclear fusion reactor using the SDN software provided by Mobiis, data was transmitted at an average speed of 27 microseconds with a standard deviation of 1.4 microseconds. 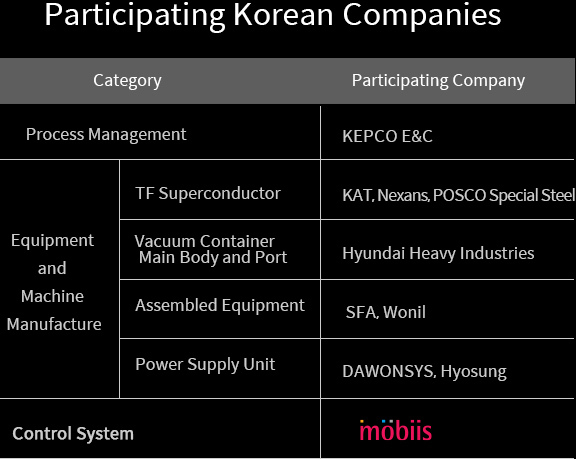 A system in charge of protecting all plant equipment, including the most costly superconductive coil among ITER equipment as wells as the tokamak, costing up to several billion won. It is an important equipment control system allowing a proper nuclear fusion generation to occur by stably controlling the power supply units supplied by Chinese and Russian companies, as well as Korean company DAWONSYS.